Venezuela received over 100 Palestinian medical students on November 6 through the Yasser Arafat Scholarship Program. They were met with enthusiastic crowds of Venezuelans waving Palestinian and Venezuelan flags. 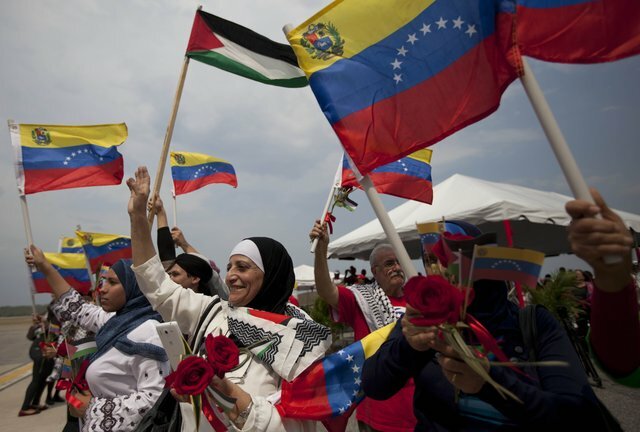 Venezuelan President Nicolas Maduro spoke at the welcoming ceremony, expressing Venezuela’s unwavering support for the future of Palestine and commitment to Palestinian youth. The new medical students will study at the Salvador Allende Latin American Medical School. They are a part of a larger group of 1000 Palestinian University students who will study for free in Venezuela. Venezuela aligned itself with Palestine under the administration of Hugo Chavez in 2006. Chavez condemned Israeli actions in the Israel-Lebanon conflict, calling for Israeli leaders to be tried in the International Criminal Court. Chavez withdrew his senior diplomat in Israel as well as removed the Israeli ambassador to Venezuela in 2006 and 2009. His administration as well as the current administration have both vocally claimed and maintained support for the recognition of Palestine as a nation state, as well as insisted on the acknowledgment of Israel’s actions towards Palestine as war crimes. Chavez himself proposed that Israel face charges for genocide. Emotions were high when the Palestinian students arrived. Upon their arrival, President Maduro remarked, “We want to see you dance again.” The same plane that also brought the students from Palestine to Caracas also brought humanitarian aid for Gaza. The alliance between Venezuela and Palestine speaks to the assertion of colonialism, an idea that Venezuelan leaders provide is a vestige of Israeli occupation. More emphatically, Chavez addressed a letter to UN Secretary General Ban Ki-Moon in September 2011 that offered full Venezuelan support of the Palestinian state while accusing Israel of “ethnic cleansing” and genocide. As Venezuela begins to offer aid to the Palestinian people, typical questions and possible criticisms regarding the effectiveness of economic aid arise. Can economic stability truly encourage peace where ideologies around religion and land ownership are central to conflict? Will economic aid go to the right places, and will it serve to debilitate or strengthen and create infrastructure? Will it be a coercive or disinterested power? Will Venezuela become a participant in the kind of “colonialism” it criticizes? Additionally, as Palestinian students become temporary Venezuelan citizenry, participating in Venezuelan higher education, will Palestinians contribute to the “brain drain” of the Middle East? As places of conflict tend to be less suitable environments for academic and professional pursuits and opportunities, the potential for an exacerbated Palestinian brain drain due to a mass movement of students is within the realm of possibility.